The soil-borne pathogen Aphanomyces euteiches Drechs is among the greatest threats to pea production world-wide. 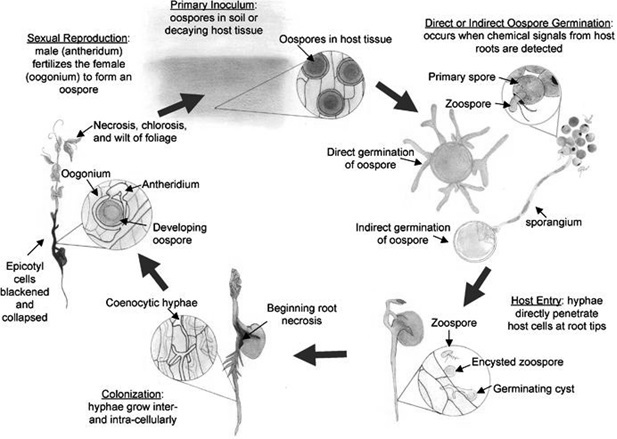 This pathogen can persist in soil for many years without a host plant and is very difficult to control due to its long-lived oospores and to environmental restrictions on fungicide application. Brassicaceae (brassica) cover crops, which are already used in agricultural cropping systems to reduce nutrient leaching and prevent soil erosion, can also be used to control some soil-borne pathogens. Most brassica plants contain glucosinolates (GSLs) and some hydrolysis products of GSLs, such as isothiocyanates (ITCs), can be highly toxic to soil organisms. Different vegetative parts of the plant and different brassica species contain different GSLs. 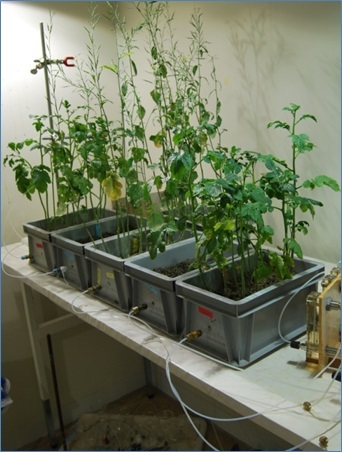 In his thesis, two brassica species with different GSL profiles, Brassica juncea and Sinapis alba, and the pathogen A. euteiches were used as models in bio-fumigation studies. In vitro experiments showed that volatiles produced from B. juncea shoot tissue strongly inhibited growth of A. euteiches mycelium, while volatiles from S. alba tissue had a weaker effect. 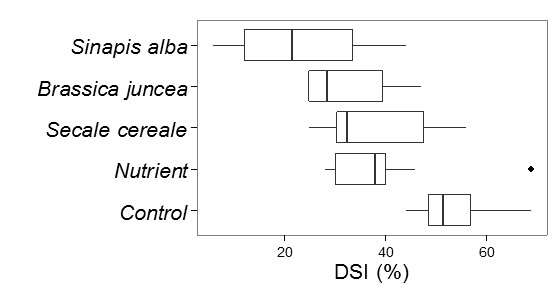 However, a direct bioassay following incorporation of fresh brassica tissues into A. euteiches-infected soil showed no suppression of root rot in pea plants. Further in vitro experiments showed that ITC concentration and duration of exposure were both essential factors for the inhibitory effect on the pathogen. 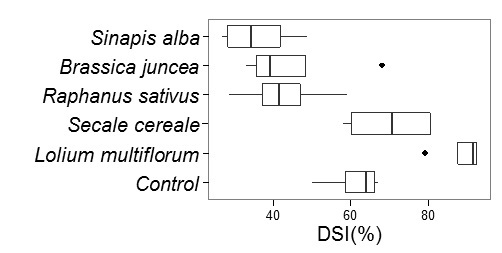 Analysis of the initial ITC production from the two brassica species used as models showed different release patterns, with S. alba tissue showing more immediate production of ITCs than B. juncea tissue. There was significant suppression of pea root rot when S. alba was grown for 11 weeks in an A. euteiches-infected soil. 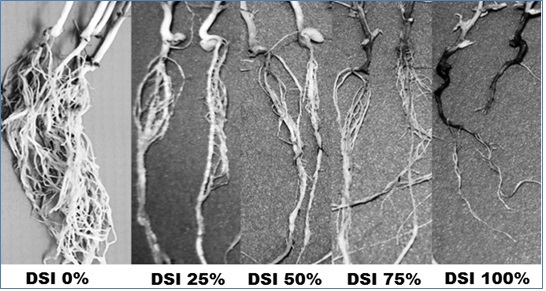 ITCs were detected in the rhizosphere of the growing brassica crops and the variety of ITCs produced by S. alba roots appeared to be the main factor for inhibition. Problems can arise in bio-fumigation if beneficial organisms such as N2-fixing bacteria and ammonia-oxidising organisms are also suppressed. However, real-time PCR analysis to quantify gene copies of key enzymes involved in ammonia oxidation and N2 fixation in soil sampled after 10 weeks of cover crop growth showed that the N2-fixing bacterial communities and the ammonia-oxidising bacteria and archaea were not negatively affected by the growing brassicas. When using brassicas to control soil-borne pathogens, important factors are the choice of brassica species, a sufficient concentration of volatile ITCs and exposure for a sufficient period of time, which may require soil covering after brassica tissue incorporation. I. Hossain, S., Bergkvist, G., Berglund, K., Mårtensson, A., and Persson, P. 2012. Aphanomyces pea root rot disease and control with special reference to impact of Brassicaceae cover crops. Acta Agriculturae Scandinavica, Section B - Soil & Plant Science 62(6), 477-487. II. II	Hossain, S., Bergkvist, G., Berglund, K., Mårtensson, A., Glinwood, R. and Persson, P. Growth of Sinapis alba in Aphanomyces euteiches infested soil reduces pea root rot in subsequent peas (manuscript). III. III	Hossain, S., Bergkvist, G., Berglund, K., Mårtensson, A. Hallin, S. and Persson, P. Influence of Brassicaceae cover crops on ammonia-oxidising and nitrogen-fixing organism communities (manuscript). IV. IV	Hossain, S., Bergkvist, G., Berglund, K., Mårtensson, A., Glinwood, R., Kabouw, P. and Persson, P. Concentration and time-dependent effects of isothiocyanates produced from Brassicaceae shoot tissues on the pea root rot pathogen Aphanomyces euteiches (manuscript).